A couple of weeks ago I received two boxes full of materials and sewing notions that had belonged to a girlfriend's mother. I called my friend and thanked her so much. It is touching to receive such a heartfelt gift! 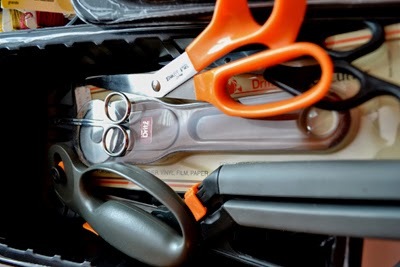 The boxes included her mother's scissors and notions and above all, scraps from the dresses that she had made my friend and her sister, along with yardage of her favorite materials. I immediately started sorting everything and as I did I envisioned my friend's mother. She was a lovely lady. She worked in our Junior/Senior High School and became the mother-away-from home for many of us at school. She was widowed early in her life and raised her two daughters single-handedly. Her youngest was my best friend in high school and we have remained friends ever since. I was always amazed at how laid- back her mother seemed for she worked ever so hard to raise and support her children. She may not have been a rich lady when it came to monetary wealth, but she was rich in love for and from her children and our community. She always had a great smile and was so silly and fun. Her girls were the same. Sadly her eldest daughter preceded her in death, dying very suddenly and unexpectedly after a very brief illness. She confided in me that she worried about her youngest daughter, my friend, being left alone. I know that she lived as long as she could to be there for her. She was a mother of a different generation. She loved to wash and iron, and my friend told me that every time she was with her girls she would wash and iron for them. My friend then clarified to me that to her mother, ironing meant ironing ALL the laundry!! I had forgotten about ironing.The only clothes I owned that needed ironing got left in the bottom of my laundry basket and were later sent to Goodwill, though I can’t imagine that “good will” actually went with them, as they no doubt arrived very wrinkly! It was a chore that I hated and I was ever so glad when real wash-and-wear clothing was invented. My friend went on to tell me that her mother never owned a dryer, and why should she? A dryer isn't needed for a person who irons everything! 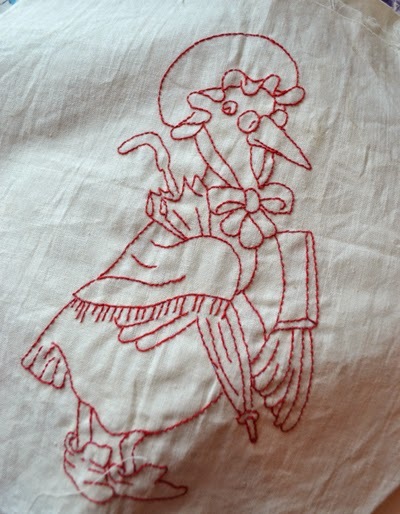 As I went through the larger box, I found five hand-made baby garments, all hand embroidered and detailed along with a set of vintage, traditional-stamped Mother Goose quilt blocks partially embroidered, and a plaid shirt with an attached note that read, “my favorite shirt –make into a dickey”. Dickeys were another thing of the past that were essential to all women’s wardrobes. I couldn't help but notice her mother's value of “frugality”, wasting nothing. In her day the motto was: "...use it up, wear it out, make it do or do without". 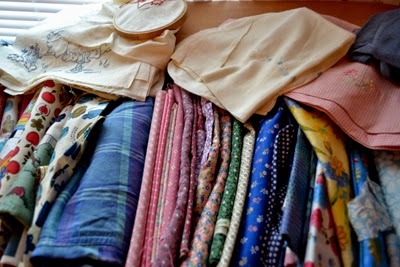 Among her sewing notions were also buttons that had been cut off shirts and sweaters before they were rendered as rags. 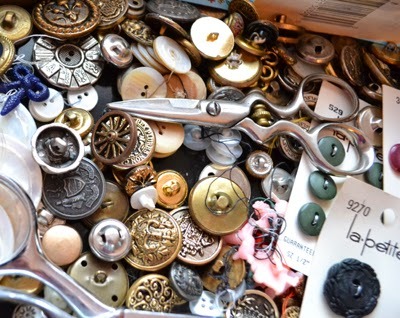 Button collections of this sort are often the best, and will look lovely decorating a wool pincushion, or flower pin. 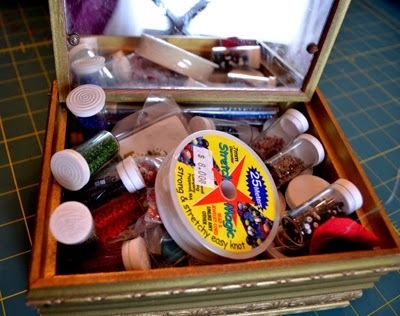 My friend told me that several more boxes were given to sewing groups close to where she lived. I had cautioned her only to send me something small due to the cost of postage. I think my friend mailed to me things that couldn't be thrown out and too precious to be given to strangers! It was a box of love passed from one generation to another. 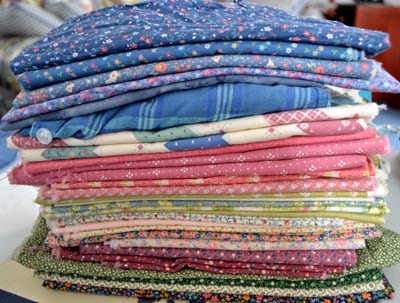 A sewer is delighted to receive such a special collection and I immediately envisioned the materials in a traditional scrap quilt. Quilts can be so special when the receiver knows the history of the materials that are used to make it and has emotional attachment to them. 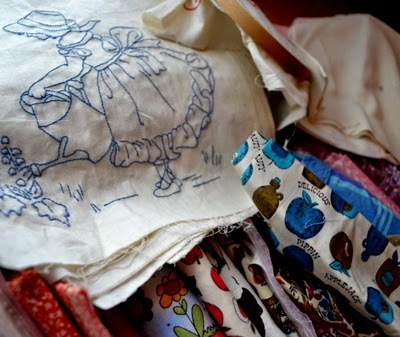 Perhaps a special crazy quilted project should be included to save some of the hand-stitches so lovingly sewed by her mother for her and her sister. This is more than a duty, it is a privilege, though my friend had no such intent in sending me the boxes. I had to take a deep breath. Didn't I already have a bucket list too long for my years? Was it realistic to take on still another project or two? I will have to pray for an extension of time to do what truly needs to be done. It is an honor, to be entrusted with her mother's stored treasures of her heart! I knew her mother would love to wrap her arms around her daughter right now, and perhaps a quilt made of her mother's materials might offer some comfort to my friend. All these items along with her life well-live are a mother’s legacy to her children and friends. She was a good-hearted woman who contributed to making the world a better place. I am so privileged to have known her! 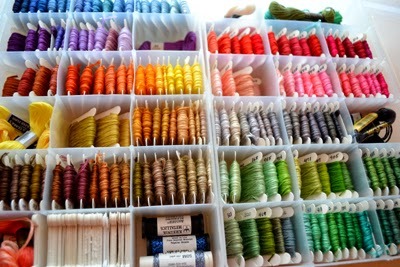 All of this would have gone to my friend's sister if she were still alive, as she loved to sew like her mother. I was sincere when I told my friend that such loving treasures from such kindred spirits would be truly valued! It is good, I think, that we treasure our legacies of our mothers as well as the women that have gone before us. How creative, tenacious and courageous they were to lead their lives with such love and how much they have passed down to us through the example of their lives! It is my prayer that God keep them in His care until we are reunited with them!! Happy Mother's Day to you all! Mother's Day isn't so much about being a mother but rather celebrating the mothers and special women in our lives, whether they be here or in heaven! This blog is dedicated to my dear friend, Linda, her sister, Carol and her mother, Evelyn (Polly) Pollard. 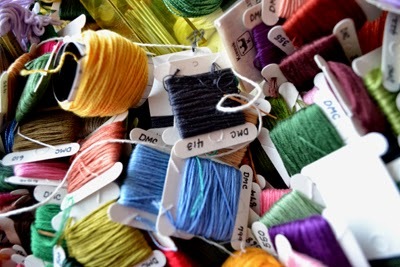 Labels: A mother's legacy; sewing tools, notions and materials passed on to the next generation, the example of a life well-lived. America, Still the Land of the Free?